Toasted, with entirely too much butter. That's how I like my Cinnamon Raisin Bagel from a doughnut shop far, far away. The closest authentic source for such a treat would be Winnipeg, Manitoba or Ypsilanti, Michigan; either would be a ten and a half hours' road trip. (Perhaps in the spring?) My version is really, really, close, and if I pair one with a cup of super-strong coffee my craving is satisfied. 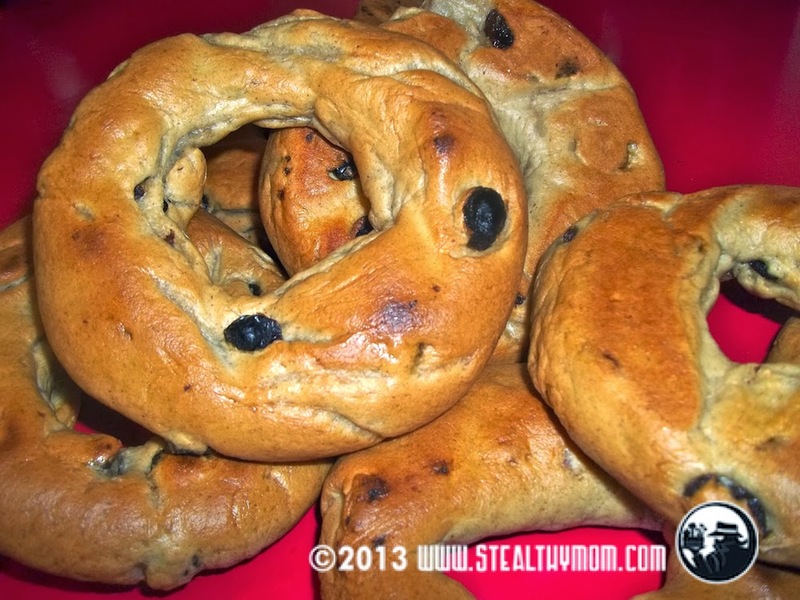 Chewy on the outside, soft on the inside, bagels are simple to make, and with cinnamon and raisins kneaded in they are just right oven-fresh or for toasting. I based this recipe on a basic one posted by John D Lee. 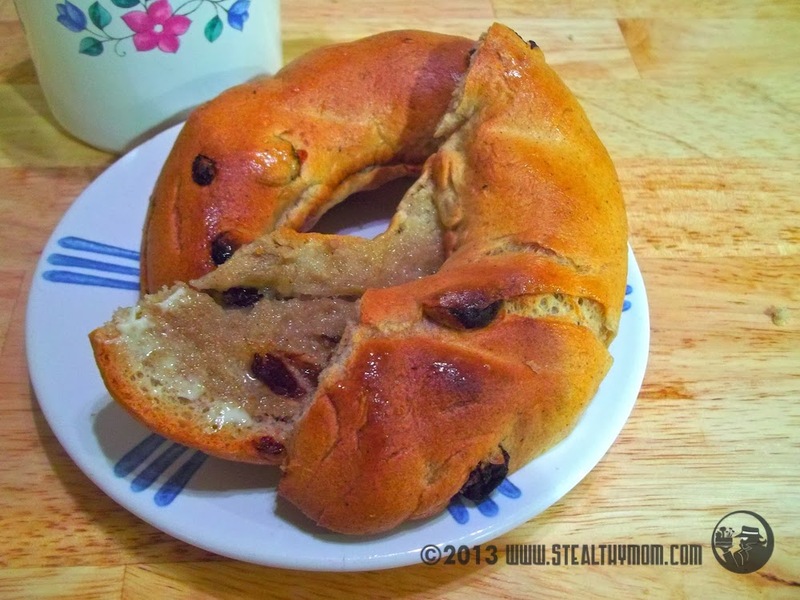 The "authentic" version uses white flour, but whole wheat makes a pretty good bagel! Turn the dough onto a floured board, and spread it out with your hands. 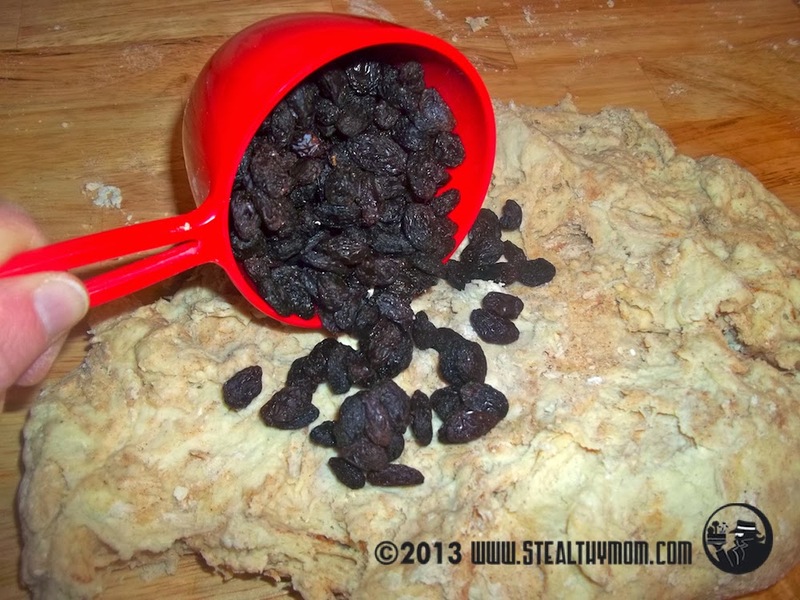 Sprinkle the cinnamon and the cup of raisins on top. 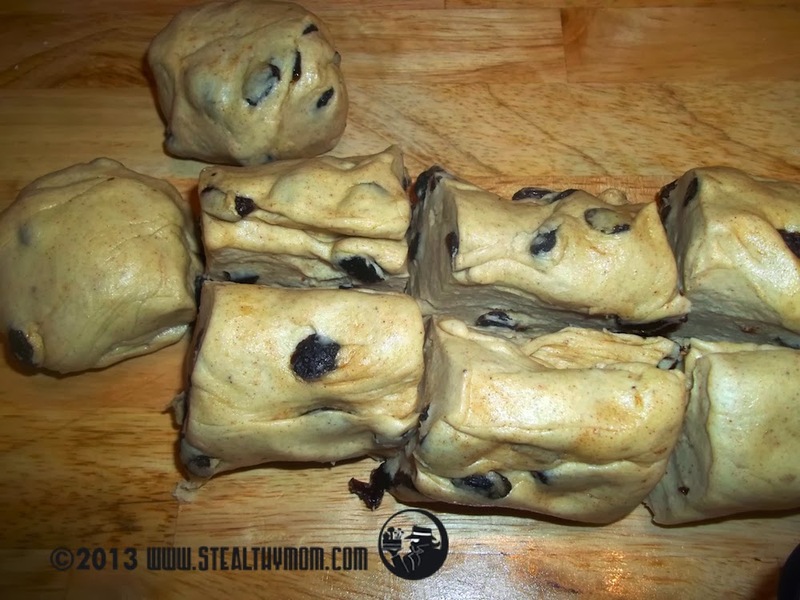 Fold the dough over, and knead for five minutes, adding flour as needed. Let the dough rest for ten minutes, then cut into eight (or sixteen) pieces. Roll each piece into a ball. 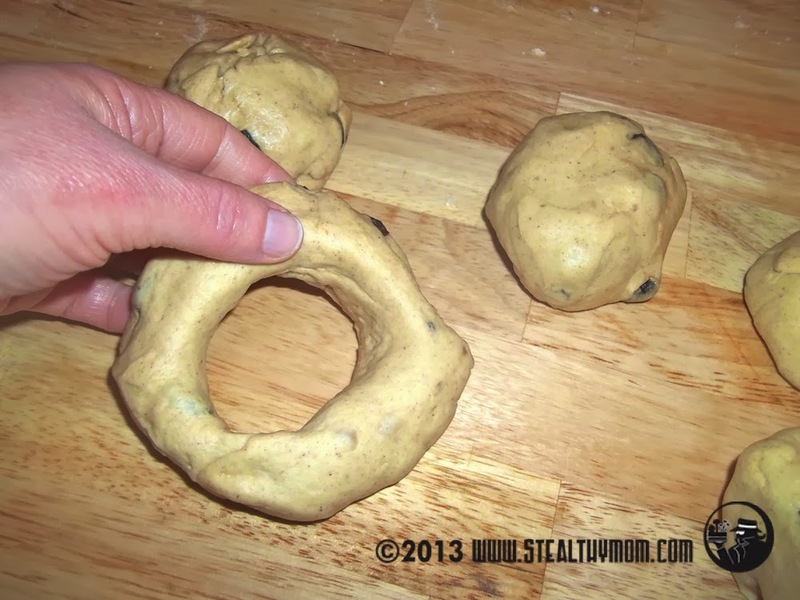 Shape the balls into bagels: Poke a hole in the middle, and gently enlarge the hole with your hands. Alternatively, you can stick your finger in the hole and spin the bagel on the board, enlarging the hole. (The kids like to help with this.) Make the holes ridiculously large, and the dough will shrink back a little. 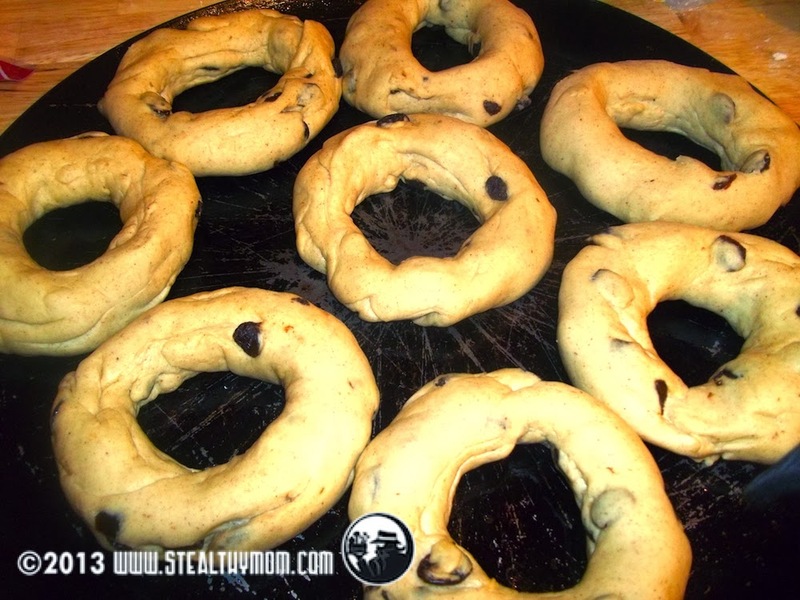 Allow the bagels to rise until doubled, about half an hour, longer if it is cool in your kitchen. Meanwhile, preheat the oven to 425F, and set a large pot of water on the stove to boil. Boil the bagels in batches: Gently drop the bagels into the boiling water, leaving enough room for each to expand and float. After a minute, flip the over and boil for another minute. 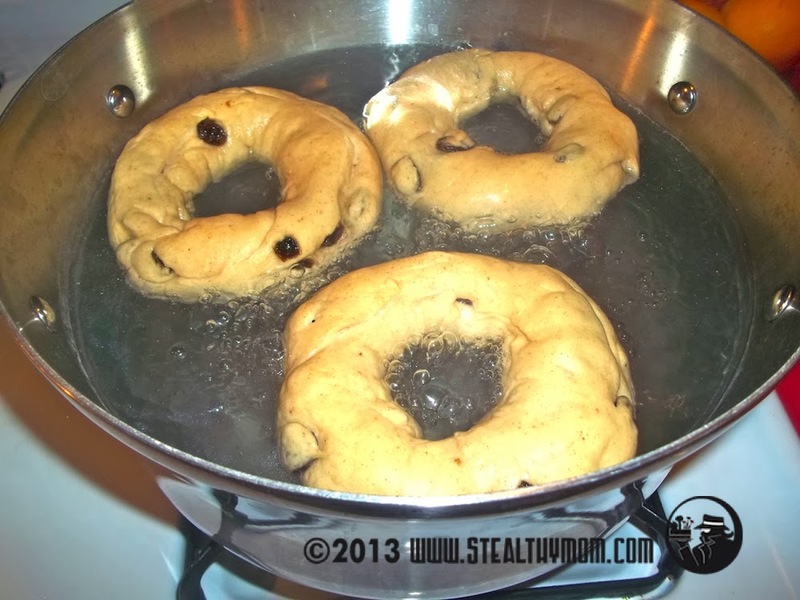 With a slotted spoon, gently remove the boiled bagels and place them on greased cookies sheets. Bake the bagels for nine minutes, then turn them over and bake for another nine or ten minutes. If you are making minis, bake them for only eight minutes on each side. When you take them out of the oven, try really hard to ignore them for at least fifteen minutes while they cool. I shared this recipe with Motivation Monday, a weekly roundup of natural recipes and craft ideas. What a great visual tutorial. I will have to try them.